Might Malaysia one day have 'halal' and 'haram' TV shows? You are here: Home » Regional news » Asia » Might Malaysia one day have ‘halal’ and ‘haram’ TV shows? Might Malaysia one day have ‘halal’ and ‘haram’ TV shows? KUALA LUMPUR, Dec 8 — A broadcast network executive has floated the idea of “halal” certification for films and TV shows as a way to allay concerns among a segment of Muslims for their daily entertainment dosage to be Shariah-compliant. Syed Shahridzan Syed Mohamed told a two-day seminar on the entertainment industry and Islam that ended yesterday that he had once mooted the idea to the Malaysian Islamic Religious Development Department (Jakim), but was shot down with the federal religious authority saying the idea was not feasible due to possible overlaps between the country’s civil and Shariah legal system. “I had discussed this with Jakim’s preaching division,” Syed Shahrizan said. “We can establish the halal logo, have standards for Islamic banking. Why can’t we work to put guidelines, halal and haram logos for the productions in Malaysia?” said the man who heads the Shariah unit in a state-owned free-to-air Islamic television network. In Malaysia, federal and state religious authorities certify food products with a “halal” logo to indicate that the food is permissible to be consumed in accordance with Islamic teachings and practices. Currently, all films must go through the Film Censorship Board, which will decide whether a film is suitable for the Malaysian audience, before they can be shown to the public. Together with award-winning local filmmaker Aziz M. Osman, Syed Shahridzan was a panellist in a talk yesterday to discuss the obstacles facing producers in making Islamic works during the second day of the entertainment seminar organised by the Malaysian Muslim Consumers’ Association. 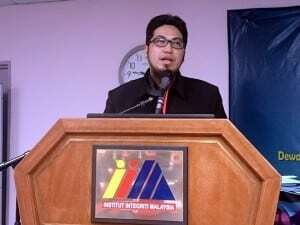 Shahridzan also claimed that the pursuit of commercial success in show business has caused Malaysian producers to feature women who “expose themselves” on air, contrary to a strict Islamic dress code. “Programmes which are Shariah-compliant are really not commercial, it is a bit hard to sell them. You have to expose a bit, show tight clothing a bit, only then can it be commercial,” said Shahridzan, who also heads the network’s Shariah Unit. In the paper he presented earlier, Shahridzan listed clothing for men and women to be one of the biggest headaches for filmmakers seeking Shariah compliance. Among the issues on the laundry list of checks faced were sheer clothing that show off the figure or clung to the body, headscarves for women that failed to cover their neck and bust area and the issue of having “too much” make-up. Shahridzan also blasted several celebrity religious teachers on-air for spreading false religious information, false sayings attributed to Prophet Muhammad, or shows which go overboard with its comedy.